Pharaoh’s Formulae: a fun approach to Egyptian Mathematics. The Egypt Centre was faced with the threat of losing school party visits when ancient Egyptian history was taken from the National Curriculum in Wales. The education programme was re-vamped, with advice from local teachers and volunteers, to cover many areas of the National Curriculum and one of the most popular activities (apart from mummification of course!) is ‘Maths and Measuring.’ The aim of the topic is to encourage children to enjoy maths and experiment using different methods of calculation and measurement. This is available for Key Stage 1 to Key stage 3. Schools have been booking a whole day session of fun maths for their pupils. Children examine the measuring units used by the ancient Egyptians and decide which ones to apply in order to measure various objects. They compare ancient measuring units, based on the width of a finger, a span of the hand and the length of your forearm, with modern measuring units and recognise the imperfections of the ancient units! During this activity they measure various objects on display, as well as themselves, and in the handling collection in the gallery. 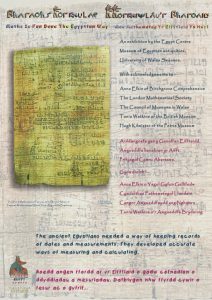 Children then look at the way numbers were written in ancient Egypt and complete simple and more complicated calculations using this system. Connections between addition, subtraction and multiplication and division are made. Other activities cover topics such as mirror images, reflection, co-ordinates, symmetry and repeated patterning. Children develop strategy and team-building skills while playing the ancient board game called Senet. We use a replica of a senet board found in Tutankhamun’s tomb and the children use throw sticks as well as a die to encourage them to explore probability. Children build pyramids using multi-link blocks and work out everyday mathematical problems of the ancient embalmer! Children are encouraged to explore number patterns, make predictions and develop mathematical strategies to overcome difficulties. 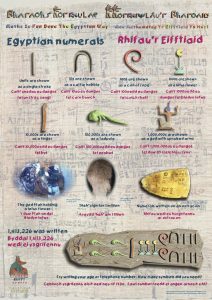 The topic proved so popular that the Egypt Centre launched a travelling exhibition entitled Pharaohs’ Formulae, of 14 display boards, free to local schools. The schools borrow the exhibition on a monthly basis and receive an information work-sheet booklet to go with it. Due to the fact so many schools are using the exhibition and many are on a waiting list, an additional set of boards has been produced.